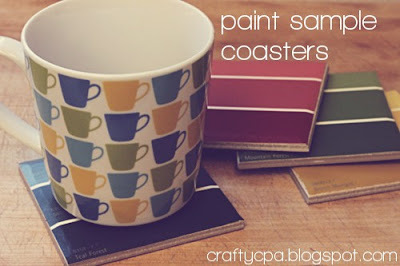 A while back while wasting an afternoon searching the web for nothing special I cam across these great coasters from www.marthastewart.com. I hate to admit it, but Martha's wonderful. 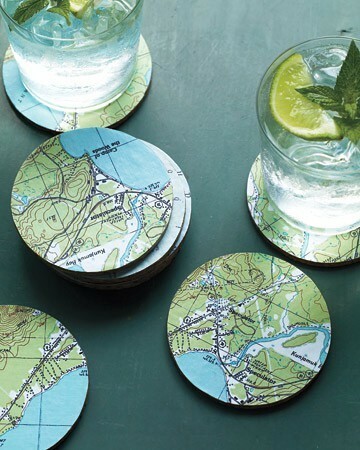 Around that same time I also found these coasters. The full example for this project can be found here. Basically all you need is some tile and some Mod Podge. For awhile now, I've thought that I should combine those two wonderful coasters. My sister Sly had an old Michigan map so I decided to make some coasters of some very important places in my life and GB's. I found a package of wooden tiles at Hobby Lobby and I chose these 4 tiles to make my coasters. Sly's dog, Charlie, was very interested in the project. I cut each area to size. Wow. I really need a a mani. I spread a thin layer of Mod Podge on the the tile. I pressed the cut section down on the tile, and then I spread more Mod Podge to seal the map to the tile. I cut the extra edges off with my xacto knife. The results! Easy, meaningful and fun. I'm sure the next time we have a party these will definitely be a conversation starter. If you were going to make coasters of your favorite places, what cities would you choose?